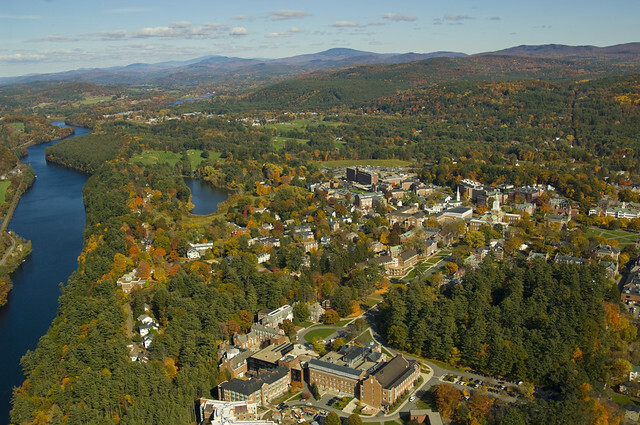 Dartmouth's 269-acre main campus is located in the heart of New England — in Hanover, New Hampshire along the Connecticut River, which marks the border between New Hampshire and Vermont. Dartmouth serves as an intellectual and cultural center for the town and its surrounding communities — together referred to as "The Upper Valley" — and nearby Dartmouth-Hitchcock Medical Center offers state-of-the-art healthcare. Up for a short road trip? Choose from three of the east coast's most renowned cities: Boston, New York, and Montreal are all within a half-day's drive. Don't have a car? Dartmouth Coach provides daily bus service connecting campus and the Upper Valley region to Boston and New York. Hanover, with close to 10,000 residents, provides the benefits of a small-town atmosphere with the educational, scientific, medical, and cultural opportunities more often associated with a large city. Hanover's natural setting and world-class facilities—as well as its numerous high-tech companies—have led people from all over the world to call Hanover home. Danny Katz '16 is a Dartmouth engineer and a drone pilot/photographer! See more campus photos on Flickr.